Situated in a quiet and relaxed country style location at the south end of Port Elgin. Five 2 bedroom, 2 storey, clean, comfortable and cozy cottages on a large shady/sunny lot surrounded by mature trees. Our cottage park is family owned and operated. Beautiful and clean Gobles Beach is just 2 km away. Mac Gregor Provincial Park is in close proximity and great for hiking, biking and nature walks. Cottages come with 3 or 4 piece bathrooms and are fully furnished and equipped for housekeeping. Families of 4 or 5 can comfortably be accommodated. Starchoice satellite TV and wireless Internet available. 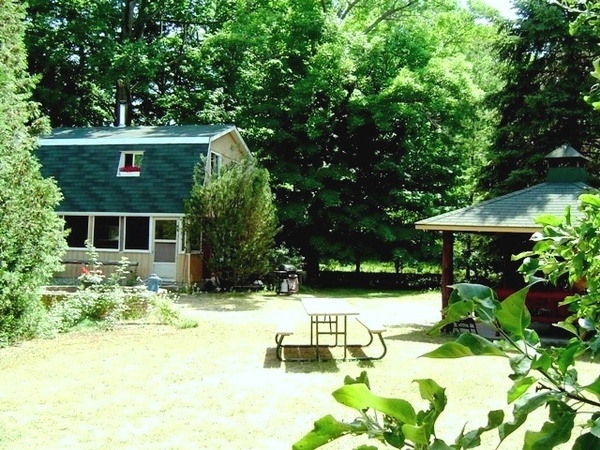 Each Cottage has private deck, patio furniture and gas BBQ. Log cabin features screened porch, horseshoe pit, gazebo with fire pit on large, private lot.